This is our favourite jam. It is a real breakfast treat and turn our toasts into sensations we can’t easily forget. Juice of 1 fresh lemon Wash the morello cherries, remove the stalks and stones. Mix the cherries and sugar mixed with lemon juice in a jam pan. Leave to steep for 2 hours. Medium heat /10 min until boiling Next put the filled pan over medium heat and bring to a boil. Remove from heat, let cool, cover and let stand in a cool place for the day. 4 gr agar-agar (4 gr / liter of juice or a sachet of powdered apple pectin) Sieve the mixture, remove the fruits and set aside. Pour the syrup back into the jam pan. Add the agar-agar or pectin, mix well and bring to a boil over medium heat. Stir, skim and let cook for 10 min. Check the consistency of the syrup by pouring one tablespoon of liquid onto a plate. On cooling, the syrup will jellify. If necessary, cook for a few minutes more to obtain a better consistency. Medium heat / 15 min total after reaching boiling Add the fruits, stir, leave to cook another 5 min., and skim again. Potting5 jars with 350 gr capacity with coversMedium heat / 10 min. boiling At the same time, boil the 5 glass jars and covers, covered completely with water, in a large pot for 10 min. Put a clean kitchen towel on the counter top, take out the jars and covers from the boiling water and set them upside down on the towel to dry. 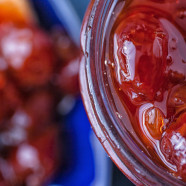 When the jam is ready, fill the jars with the boiling jam to the rim and clean the rims with a dry towel. Cover the jars immediately, put them back on the towel upside down and leave to cool. On cooling, a vacuum will be created. The next day, turn the jars back upright and store in a cool, dry place away from light. Pick the cherries during good weather days far from rainy days. They will have less water content. Choose sun-ripened cherries. They will be sweeter and more fragrant. This will reduce the amount of sugar needed. That looks delicious and you have amazing photos!